My film is about robots, and humans, but mostly robots. In my movies I love to explore the relationship between humans and robots. It is a subject that really interests me, and I try to approach it from different angles. I started wondering what it would be like for a human, a generally emotional being, to be raised by a robot, a being based in logic. I also wondered, if given the proper level of artificial intelligence, how emotional could a rational being like a robot become. Could this protagonist grow to care for the human he has raised, or will he just see the human as a means to an end? Or, in the case with Quarantine, will he choose to ‘quarantine’ the human like his programming tells him to, or will he go to any lengths to keep her safe. Since I was small, animation has been my passion and shaped much of my personal character. Writing and story design for animated features and television shows is how I want to spend the rest of my life. I love crafting new worlds and new characters to fill those worlds; I guess you could say storytelling is my passion, and animation is the medium in which I prefer to tell my stories. I’m also very much into the whole ‘defy your destiny’ premise. Quarantine, like most of my films, started out as vague character designs and a vague concept of the world they lived in. Only over the course of designing and building the characters and sets, did the story begin to take shape. I took some risks and started without a script, only an idea of what I wanted floating around in my mind. 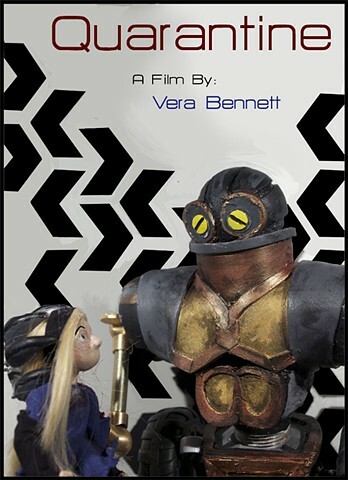 Quarantine was shot in puppet stop motion style, with all sets and characters hand made by myself. I wanted a more ‘choppy’ feel to the animation style that would add to the film’s ‘grungy’, post-apocalyptic world.